What are the best weightlifting shoes? Converse All-Stars! Most of you folks know I’m primarily a runner. I tend to prefer meditative exercises (running and yoga, specifically), but I also really, really, really like kettlebells. I’ve dabbled in powerlifting with the Stronglifts 5×5 program (which is awesome), and I want to again. And as a runner, I know bunches and bunches about the best running shoes to buy. I have my favorites (Asics Nimbus, New Balance 1080, Altra Olympus), and I know their strengths and weaknesses. But when I started strength training, I had absolutely no idea what the best weightlifting shoes were. So I did exactly what you’d expect: I asked Twitter. And the answer that came back resoundingly from all my lifter and CrossFitter friends was the same: you need to wear Converse All-Stars if you’re going to be weight lifting. Until then, I had always done cross-training of any kind in my running shoes. If that was walking (for exercise, not for daily wear), I was in my Asics. If I was cycling, it was my Altras. If I went to the gym, it was in my trainers because that’s what you wear to the gym, right? Apparently, not. So I dug in and asked my buddies for their recommendations on the best weightlifting shoes around. I was told to buy Converse All-Stars, preferably high-tops. After trying their advice, I can honestly say that Chucks are absolutely the way to go for strength training. But why are Chucks the best weightlifting shoes? After doing my due diligence on the subject (and beating out my skepticism from being an ultra-intense running shoe fanatic), I really came across 4 solid reasons that I never wear anything but my Converse when I’m gonna be lifting weights at home or at the gym. Ideally, you don’t want your shoes to have a heel on them. You want your entire foot to be on the floor at the same angle so that you don’t put extra strain on your joints, muscles, and tendons/ligaments. Because Converse shoes are made totally flat, it’s essentially like you’re barefoot. This comes into play especially with exercises like squats where your form can get thrown off because your heel is sticking up higher than your toes. Personally, I can get a much deeper and comfortable squat when I’m flatfooted. I have given up even doing bodyweight exercises for my legs if I’m not in my Chucks. So yeah, their flatness helps you improve your form, which in turn improves your weight lifting. Yay! For runners, a lot of think the best running shoes are the ones with metric ton of scientifically engineered gels. The best weightlifting shoes, though…not so much. The benefit of Converse All-Stars is that they are rubber and foam. And they’re pretty sparing on both of them. This lack of cushioning gel is awesome for strength training because the last thing you want is when you have hundreds of pounds held precariously above your head is for one of your shoes to literally lose its support and the gel burst. These gels aren’t meant to support consistent pressure. Because of how the gel works, you always sink into it a little. While that gives the feeling of walking on clouds, it also makes it so that your form will shift a little, your ankle will turn, and you will drop the loaded-to-the-max barbell (potentially onto your precious little fitgeek head). And we don’t want that. Converse shoes (and others made specifically for weightlifting) don’t have that give. So you can be sure that you’re in full control and not at the mercy of equipment failure. Just make sure you secure the clips on the barbell, all right? At least, high-top Converse do. If you lace them all the way up and tighten them, you have a decent canvas brace to keep your ankle from turning. I have definitely noticed a difference in my stability when I wear my high-top Chucks versus my low-top ones (and especially compared my running shoes…obviously). Now, keep in mind this isn’t like wearing an ankle brace. It is not going to keep you from turning it if you’re doing something super intense, but I know I’ve had much better luck with my ankles not giving way or getting hurt (they’re weak, and I’ve recently torn a ligament from simply walking) when I’m wearing my Converse laced all the way to the top and tightened up. Low-top Chucks work just fine for lifting, too, but you’re not getting this added perk, so I always go in my tall ones. I love bright shoes. I love gaudy shoes. (Who, me? Want to get noticed? Naaahhhh…) And it’s very hard for men to find bright colored running shoes. Not the case if your weightlifting shoe are Converse. I have purple ones and bright blue ones, black ones and flannel ones and purple plaid ones… But my favorite weightlifting shoes? Because you can get Converse All-Stars in all colors and designs, you can really let your personality shine through. And I have to say, there really is something empowering about weight lifting when you’ve got Superman helping out. Are there other options for weightlifting shoes? Absolutely. There are tons of specialty weightlifting shoes out there. But most of us don’t need to spend the money on them, honestly. 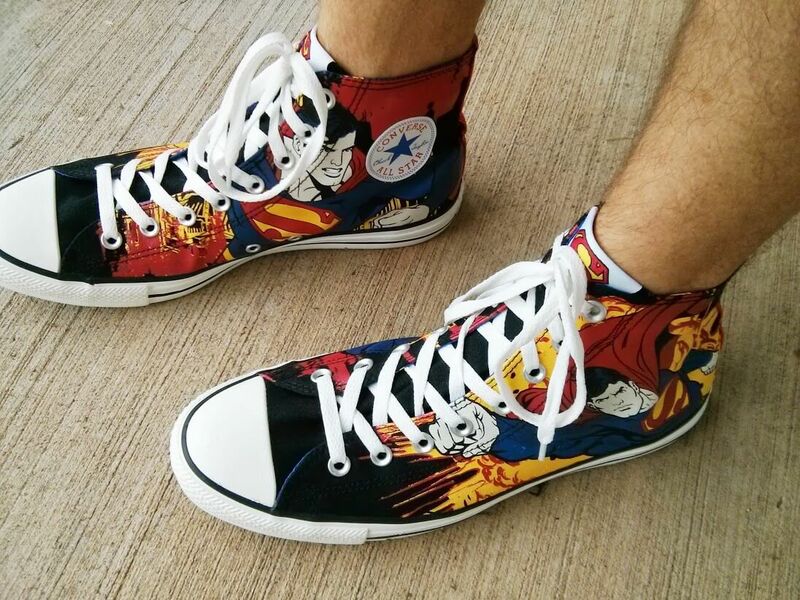 I was able to get my Superman Converse on clearance for about $30, and my others have come from eBay or thrift stores and cost anywhere between $7 and $13. When you can get one of the best weightlifting shoes available (outside of elite competitions, obviously) for such a cheap price, there is no reason to a premium for something you don’t need. If you use Converse as your weightlifting shoes, I want to see them. Let me see your bright colors, your geektastic designs, or even custom paintjobs. I’m on Twitter, Facebook, and Instagram as @geekfitnesscast, so send the pics my way!